Let your military service serve you. At Ryder, we believe that veterans bring valuable skills to our business. 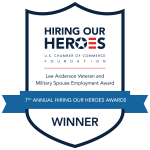 We employ more than 3,700 current and past military members. We’ve found the training and skills they developed in service to our country serve them well in business. In fact, if you have – or currently are – serving in our country, we hope you’ll consider bringing your military experience to our organization. with company contribution and match. You take care of us; we take care of you. We understand your most important job is at home. At Ryder, we understand the value skilled veterans bring to our team. And for 80 years, we've built our reputation on some ideas that you'll recognize. Character. Judgment. Relationships. Results. These qualities have made us one of the world's most recognized providers of transportation solutions. And if you share our commitment to deliver personalized service at the highest level, find out what our principled way of doing business can mean for your career. Discover endless opportunities and an open road to success. When you take your place on our team, you'll work alongside smart people you can count on, in an environment that encourages you to be your best. So whatever your goals, at Ryder, we'll get you on your way to a rewarding career. We're hiring veterans, reservists and separating military members for roles including logistics, operations, diesel mechanics and CDL drivers. You value a commitment to service. We'll make you feel right at home. In 2015, we launched our Veteran Buddy Program that pairs Ryder employees who are military veterans with new veteran employees. The program is designed to help ease the transition from military to civilian life, which can be a major challenge for recently separated veterans returning to the workforce. This new program takes these efforts a step further once the recruiting process is completed. Veteran new hires are assigned a Ryder military veteran “buddy” who will be available to help them assimilate to their new work environment. We have found that simple gestures such as showing a new veteran around the office or shop and being available to answer questions can help the new veteran employee settle into his/her new environment with ease. Ryder currently has more than 2,700 veteran employees in the U.S. Among those, 400 have been selected to participate in the program at Ryder locations.